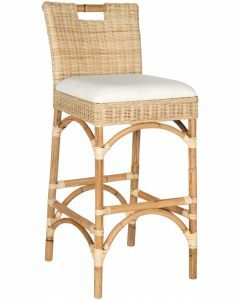 Entertain in style with this rectangle bar stool. Designed to bring French charm to the table, its chic navy upholstery is paired with finely carved distressed white wood. Designers use it to add instant character to any dining area or breakfast bar. This stool measures 23.5" x 19.3" x 47.3”; seat measures 19.25" x 18" x 30”. Click on images for greater detail.